There are a lot of applications on the Google Play Store, which claims to help us manage our time, schedules, or aid saving our money, track our actual spends, and assist us in setting a specific goal. Others even took as far as forcing you to cash-in your money using a progress shading game. But are these applications any good? 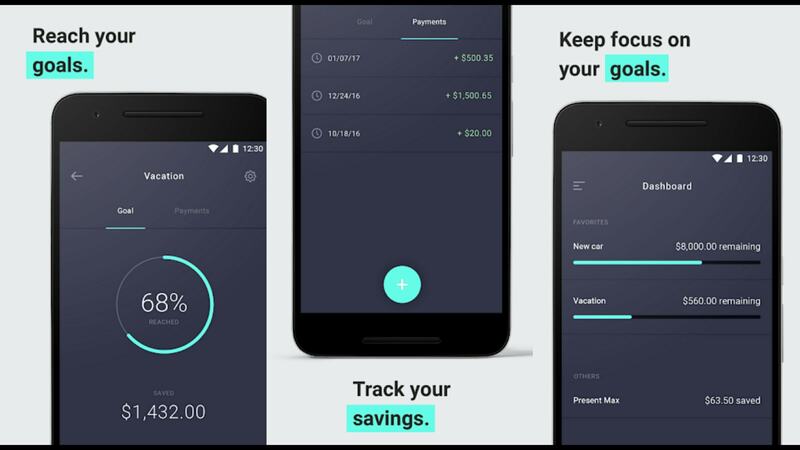 Here are our top picks for the best time and money management apps for the month of August. Loop is an ad-free and open-source Android app. The idea is that you create your own list of good habits, and track the progress over time by marking the dates when it was executed. It even has a reminder feature, so you are always reminded to complete these habits, which also send reminders on a connected smartwatch. 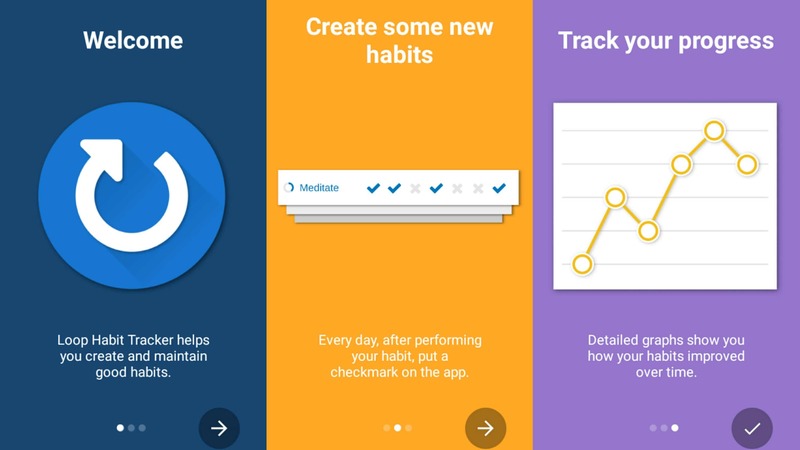 Each habit comes with its own “Habit score” which shows you your current streak, complete with detailed graphs and statistics. The only complain I have with this app is the “widgets” which fails to display on my home screen. Other than that, I think Loop is a good app. The minimalistic and material design is an eye-candy for any stock Android fans. College life is a bit messy, and the same goes for the class schedules. ClassUp will help you manage classes, create and organize notes, and even track some school-related tasks. 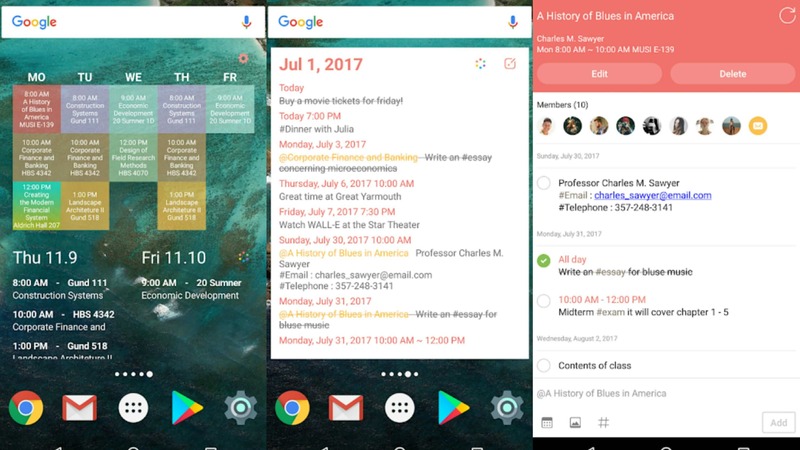 What I like the most though is the widget, which provides you with a quick look at your timetable without actually launching the app. You also have choices of colors to set in each subject, which makes things a little bit easier. Especially if you like associating subjects with colors. Always get distracted by your phone when studying? Flip is the perfect app for you. 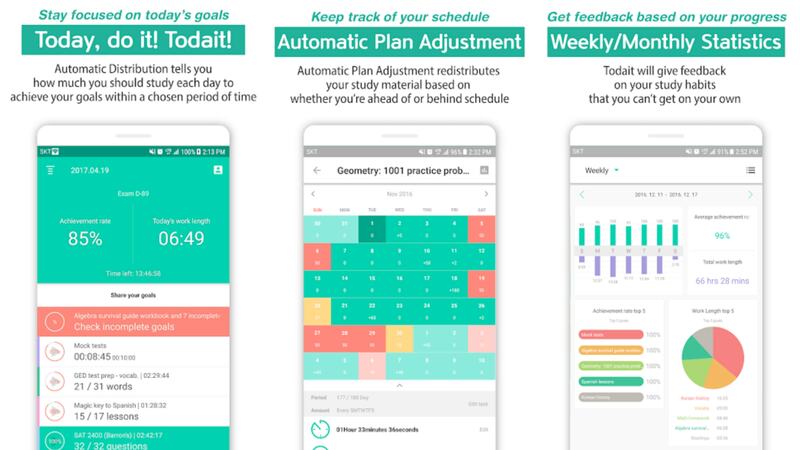 Flip measures your study time, and focus level with some weekly and monthly statistics. 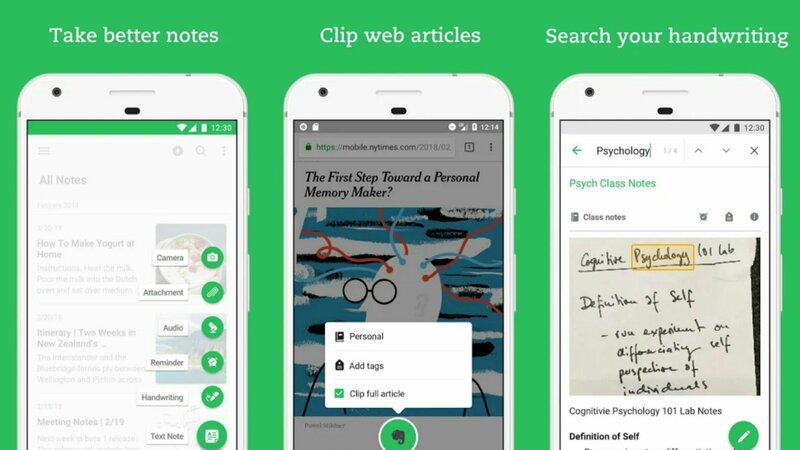 All you have to do is flip your smartphone, and the app will accurately measure your study time. 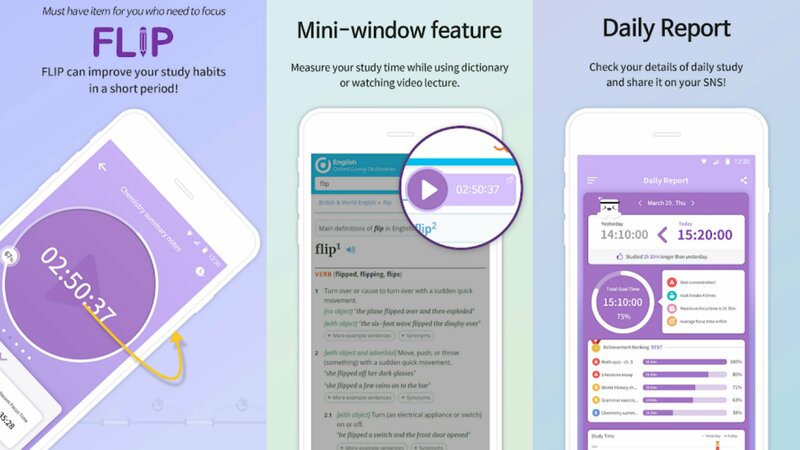 There is also a mini-window feature, which continues to measure your study time even while using your phone as a dictionary or streaming a video lecture. Flip utilizes a unique time management method called the “Pomodoro Technique”. Pomodoro was developed by Francisco Cirillo in the late 1980s and refers to a time management method, which uses a timer to break down work into intervals, with short breaks in between. 1. Choose the task to be completed. 2. Set the timer to 25 minutes. 3. Work on the task, until the timer rings, and then mark it as finished. 5. In every 4 Pomodoros, you are rewarded with longer breaks. Ipon is a Filipino word for “saving”. The Ipon app lets you track what goes into your bank (or perhaps piggybank) using a fun little progress shading game. The idea is simple. 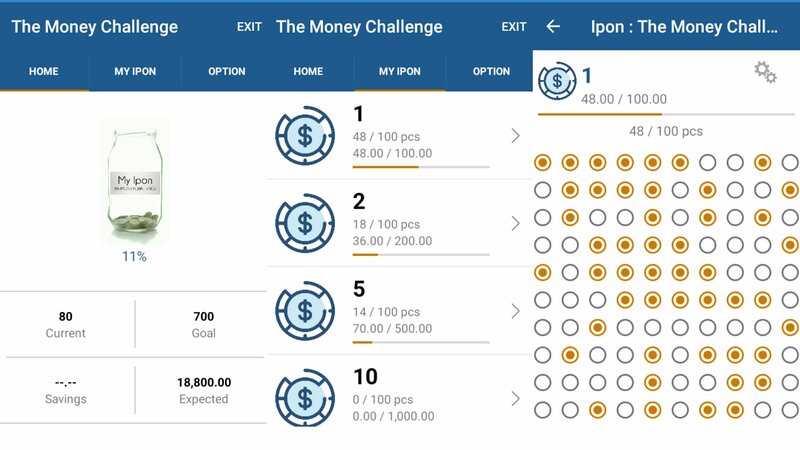 The app provides a “pre-set goal”, which is divided into “mini-goals” with different denominations. This saving technique is very popular in the Philippines and was even featured in the national television across the country. Each mini-goals contains 100 unshaded circles which you will shade every time you bank-in an amount equivalent to the asking denomination. To make it simpler, if you drop in 1 USD to your piggy bank, you will have to shade one circle under the 1 USD denomination. After you shade all the circles under the 1 USD value, you can then proceed to the second goal, which is 100 pieces of unshaded circles worth 2 USD, doubling your previous goal. However, You can always skip from the first goal to the other. For example, you have an excess allowance worth 5 USD. It’s up to you to cash that in under the 1 USD value, or under the single 5 USD denomination. Unfortunately, there isn’t an Indian Rupee under the choice of currency. But you can always use the USD, which is approximately equal to 68 INR. During the Second Assembly of the World Council of Churches in 1954, former U.S President Eisenhower said in his speech: “I have two kinds of problems: the urgent and the important. The urgent is never important, and the important is not urgent.” This is how the former president is said to organize his workload. Ike also allows you to add due dates and features a reminder in multiple timeframes or even location-based. That means you can set the app to remind you once you enter or leave a place. You can also add images and audio, which integrates with Google Speech to text (helpful if you’re the lazy type), as well as colorful material design widgets. Bucket is one of my favorite apps on this list. There’s actually not much to talk about it, but it does help me a couple of times reaching my goal. It’s simple, minimalistic, elegant and intuitive. So, you add the things you want to save for (for example, a new computer), then every time you add money to your saving’s bank (or anywhere of your choice), you have to enter the amount in the “Payments” option. Just like you are paying for something installment, minus the headaches and the never-ending due calls. After you added a payment, you will see a visual feedback with the percentage of how far you are from reaching your goal. And I tell you, it’s satisfying to see the percentage going up. On your “Dashboard”, you are greeted with a quick preview of the remaining balance to completing your target. Simple. There’s no widget feature though, so you have to launch the app to see your progress. Hopefully, the developer will add this feature in the future update. Still, I would be more happy to recommend this app to everyone. 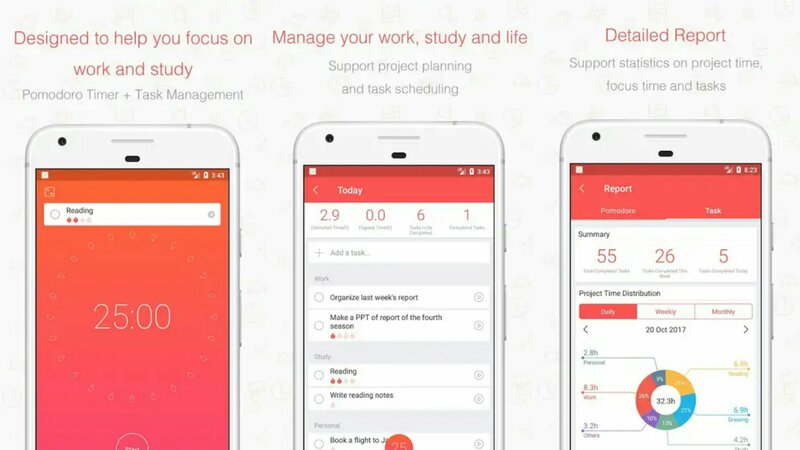 Todait is yet another study-oriented app. It automatically plans and divides your study materials over a specific period, complete with detailed statistics. To use the app, you have to enter how much time you can spare for each subject, and how many hours you’d like to spend in studying per week. One of the unique features of Todait is its ability to automatically redistribute the study material based on whether you are ahead of time, or behind the schedule. There is also a “Lock-out” mode, which prevents you from using and getting notifications from other apps just until the stopwatch stops running. The pastel colors are also very eye-catching. Evernote must be the most popular app on this list. It allows you to take notes, write journal and memos, create a to-do list, import images, scan documents, take handwritten notes, and even make sketches. You can also clip a full article from your browser, which you can use offline. The thing I like most about Evernote though is the ability to search an exact word from your handwriting, and scanned materials. This feature eliminates the need to open each of the photos to look for specific content. Just one search away. 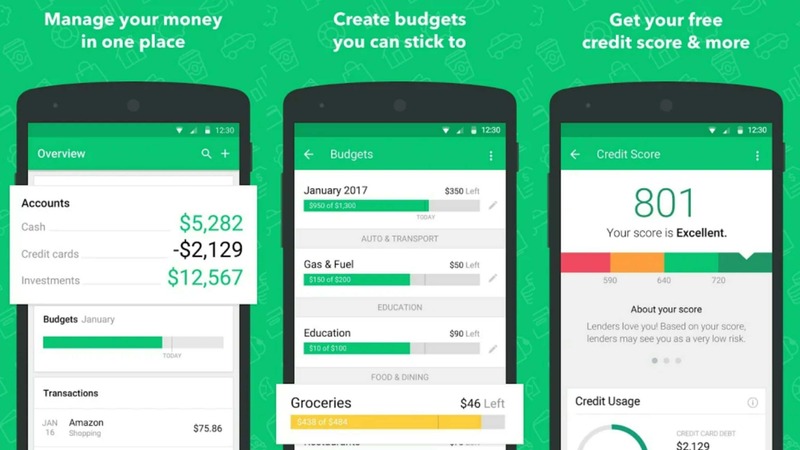 Money Lover, as it suggests, is a top-rated expense tracker and budget planner app. All you have to do is log every time you spend, with the exact price of goods and services you have consumed. It also delivers detailed reports, which pies your spending so you know which area you spend the most. There is also an option to budget your money. For example, we set our food allowance to only 100 USD, which is good for 2 days. What the apps do is record every time we spend the money we allocate for this area. Money Lover also has the ability to scan receipts so we don’t have to type every time we shop. It also tells how much money is left for the remaining days to come. There is also an option to link services and bank accounts on Money Lover app (don’t worry, it’s unlikely for an Editor’s Choice app to swindle people). 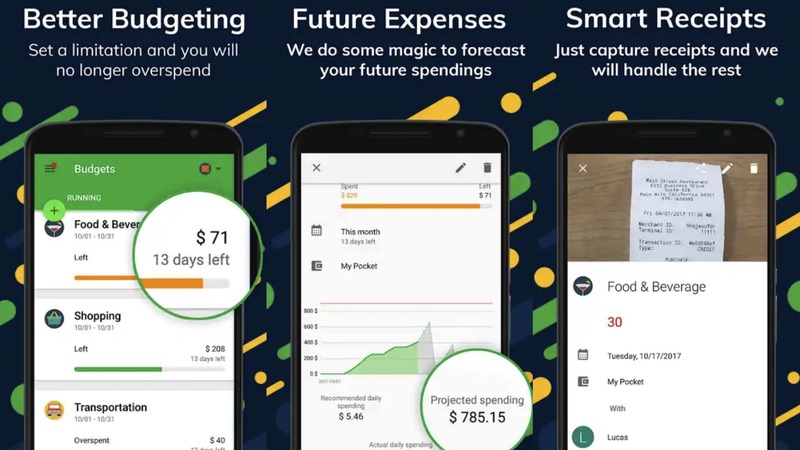 The app also adapts to our spending behavior and provides an expense forecast. There is also a due date reminder, in case we forget about our monthly dues. This app doesn’t work like any of the other entries on their list. Instead of helping you to plan and manage your money, time, and schedule, Learn wants to teach you how to invest in stocks. 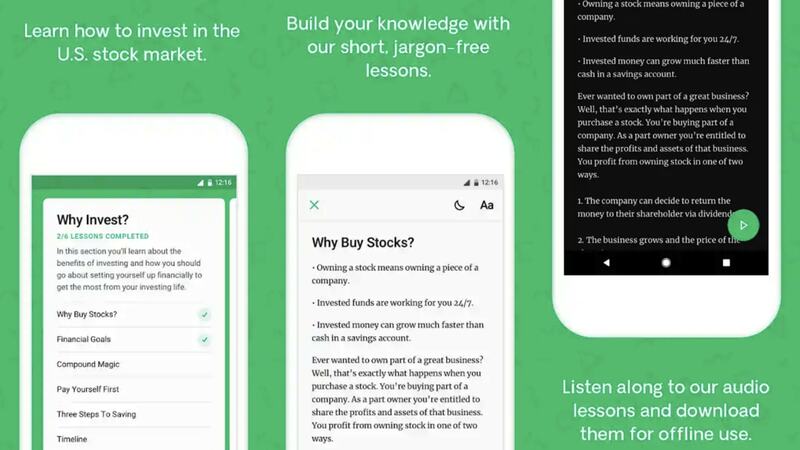 The app contains 40 lessons designed to teach you the fundamental principles of investing in the stock market. Each lesson only takes about a minute of reading but is also available in audio format. You can mark each lesson as ‘read’ once completed, with the progress tracker. If you don’t want any unnecessary features from your expense tracker app, then Simple Expense Note is for you. 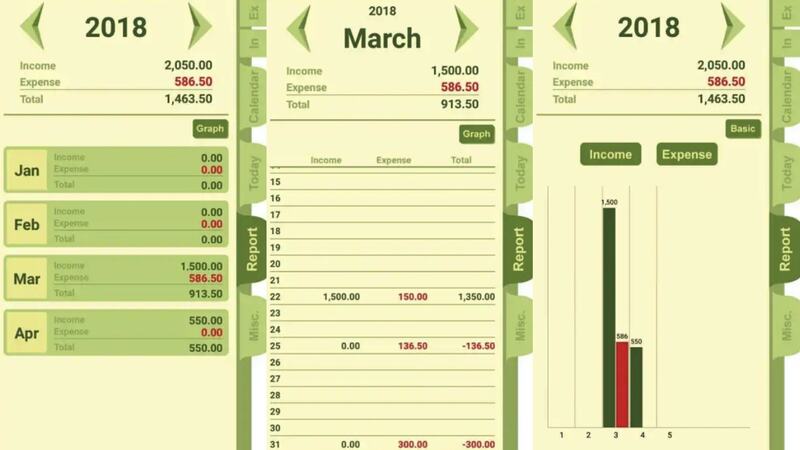 The app allows you to record your income, and expenses in the most straightforward way possible. What I like about this app is its classic looking user interface, and nostalgic pastel colors, which reminds me of the planners from the old days. Mint provides you access to all of your finances, could it be a bank account or personal investments. It lets you track your bills alongside all your current account balances, budget your remaining money, and remind you of your monthly dues. It is also secured with multi-factor authentication, and the company, Intuit Inc., participating in security scanning with VeriSign. 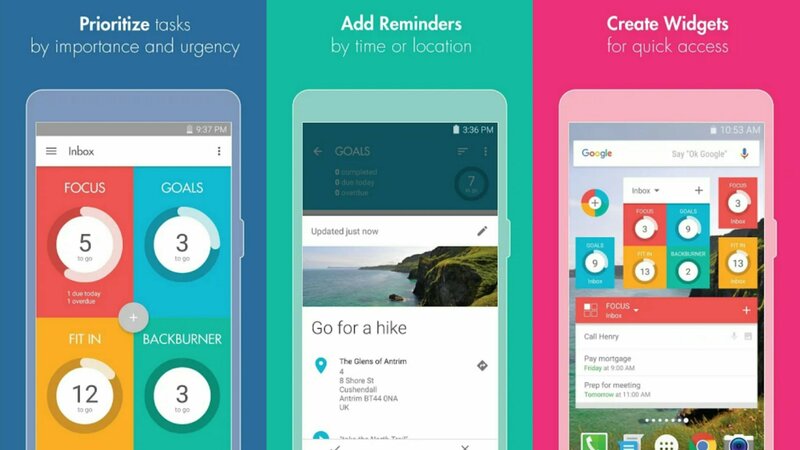 Focus is one of the best looking and effective time management apps on this list. Just like Flip, Focus utilizes the “Pomodoro Technique” but does it at the simplest way possible. The color gradient is easy for the eyes, and the UI itself is beautifully executed. Focus allows custom session length, short break, and long breaks. Just like Flip, Focus allows you to concentrate on your work, usually around 25 minutes, with short breaks at the end of each session. Every time a user completed four “Pomodoros”, he is rewarded by a long break. Focus To-Do is another beautifully designed Pomodoro timer app. What differs it from any other Pomodoro timer apps on this list though is the support for project planning and task scheduling, with detailed project time distribution. Focus To-Do also synchronizes your data to other devices, whether you have a Windows PC or macOS computer. You can also customize the theme and timers to your liking. And best of all, the app supports white noises, which is also fully customizable, to aid your concentration. FamCal is a calendar app designed to sync combined calendar data to each of the family members. So, every time a family member logs an event, task, notes, and birthday reminder, the data is shared to all devices. There is also an option to create shareable grocery, and to-do lists, and even contacts. Users under one account can also interact with things like memo with support for comment and push notification. Dreamie Planner is a simple note app, with daily, weekly, monthly and yearly planner. 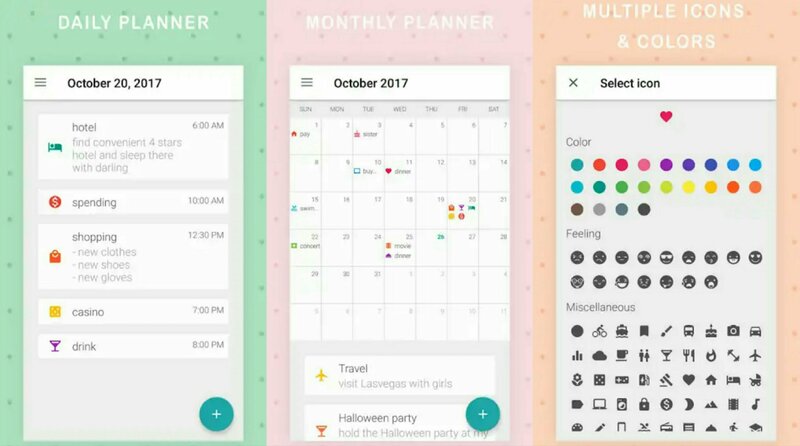 Aside from its note, and planner functions, Dreamie Planner also works as a diary with a collection of unique emojis you can use as a calendar marker. 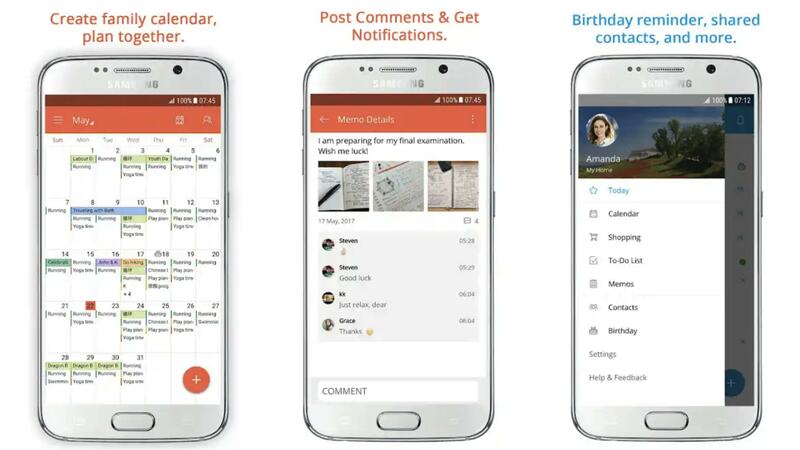 To wrap up, the app also provides themes to suit your mood, and backups all your data to the cloud, which can then be easily integrated on the Google calendar app.